Sagira cuts out the sound of the people down below. The Commons seems fairly deserted, except for one soul on the couch. And oh look there's those baubles again. It was a tough season with lots of great applications! It was very difficult for us to narrow down the field! But we did it! 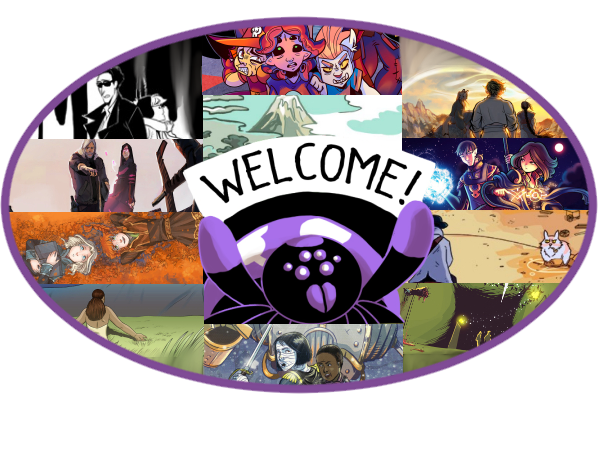 and we are welcoming 11 new comics and their creative teams to the Spider Forest Webcomic Collective! Webcomic artists often have to be their own web designers as well, and that can seem like a very complicated task. But fear not! Help is on the way. In the first part of the episode, Christina Major of Sombulus interviews Ben Gremillion, the co-creator of The Grawlix CMS, about the Content Management System he created, and the future plans for it. In the second part, Daniel Kelly of Saffron & Sage leads a roundtable discussion between Sophie Pfrötzschner (Soul’s Journey), Monica N. Galvan (Moonslayer) and Alyssa Alecci (Lapse) about what makes a good webcomic website, the many benefits of having a site of your own, and the weaknesses and strengths of the various CMSes that webcomic artists can choose from.